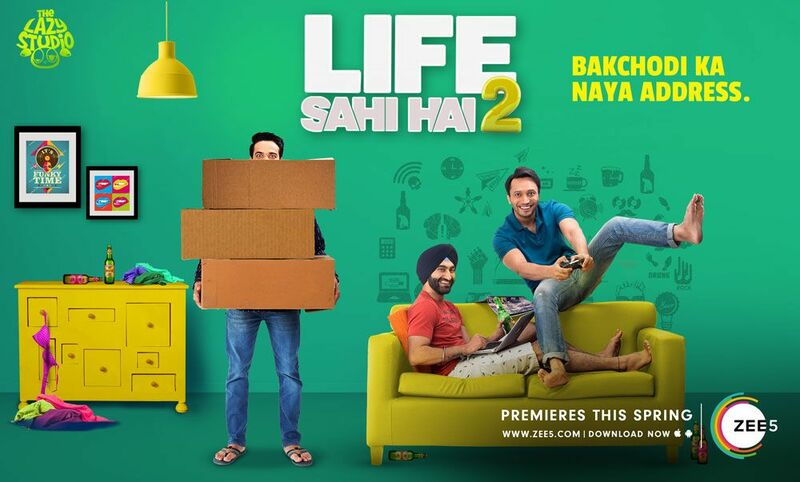 ZEE5, India’s largest and most comprehensive digital entertainment platform for language content, today released the second season of one of their most awaited show Life Sahi Hai 2. In the new season, the duo of Amit and Jasjeet are joined by a new roommate, Vaibhav. That makes it three – the perfect number for trouble! Meet the LSH boys – Amit, an MBA who has a stable job and girlfriend. His whacky analogies in every episode set off an absolute laugh riot. Jasjeet on the other hand is a complete bad boy whose sole motivation in life is to drink and date girls. Vaibhav is the single sober one among the lot. This season sees the boys landing up in various uncomfortable situations – with their boss, parents, neighbors and girlfriends – that only they are capable of! Join them as they get in and out of sticky situations, laughing their way through every situation, still believing that Life Sahi Hai and giving us “Bakchodi ka naya address”!. The sitcom goes live on 5th April and will be available for binge watching exclusively on ZEE5. ZEE5 has a rich bouquet of exciting original content lined-up which will feature some of the biggest and most entertaining faces from the world of Indian entertainment. The slate will be launched with 20 original shows and will have 90+ shows by the end of March 2019. Availability: The ZEE5 App can be downloaded from Google Play Store http://bit.ly/zee5and and iOS App Store http://bit.ly/zee5ios. Also available at www.zee5.com, as a Progressive Web App (PWA), and on Apple TV and Amazon Fire TV Stick. ZEE5 also supports Chromecast. Pricing: Freemium pricing model with both free and paid premium content (including Originals) to cater to a mix of audiences. Viewers who subscribe to the ZEE5 subscription pack will get access to the entire library of content at a special launch offer price of INR 99 per month instead of the actual monthly pack price of INR 150.